Q. Which character is suitable for me? A. By reading this guide, you will be able to find out what character suits you. There are many jobs for you and by their skill keys, it will fit your timing with chaining or comboing. Q. How hard is the character? A. I’ll put a scale of 1 to 5. 5 being the highest, meaning hard to put in chains or combos, or hard to keep it up in stage. Q. What if I don’t find a character right for me? A. Then I have no help there at all. Best choice is to pick three favorite characters, do a lottery drawing, then pick him/her. Story : Sieg is an enthusiastic 17-year old. His father was a leader of a highly reputed mercenary group that embarked on many adventures. Sieg is on a journey to find the legendary dragon “Kseidon”, and solving the mystery of a puzzling note Sieg’s father left him. Sieg is simple-minded and easy-going, but becomes unstoppable once he is angry. 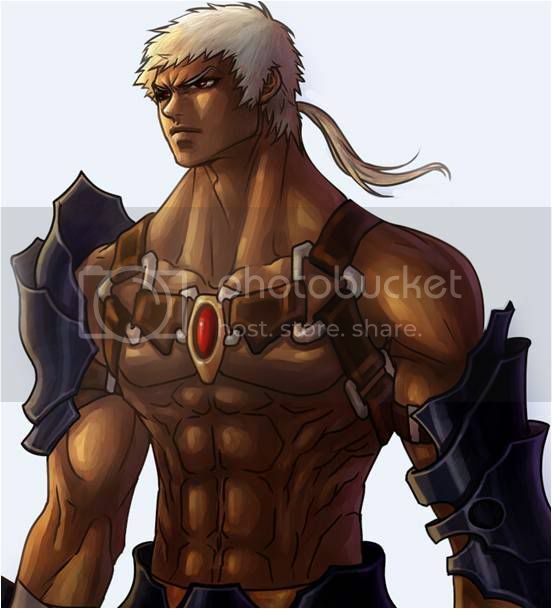 Sieg specializes in using a two-handed sword in combat, with unique skills and a variety of combos. Sieg is recommended for those players who would like a semi-fast action combat, and those who can handle some slow actions of Sieg into making them fast and easy. Stage: Sieg can handle grouped enemies quite well. Although he has to be close, you have to be careful in attacking. Skills such as Destruction Fist, Crescent Moon Sword, and Whirling Sword are quite best for Sieg in Stage Mode. Scale : 3 Sieg has a bit of difficulty handling in stage, but is fine with some help of party members. PvP: Sieg needs some quick fingers for those that want to do combos. He has some slow actions, if you cannot cancel his key-sequences fast. To really dish out damage in combos, you have to add points into your necessary skills very carefully. Scale : 5 Sieg requires quick and precise timing. 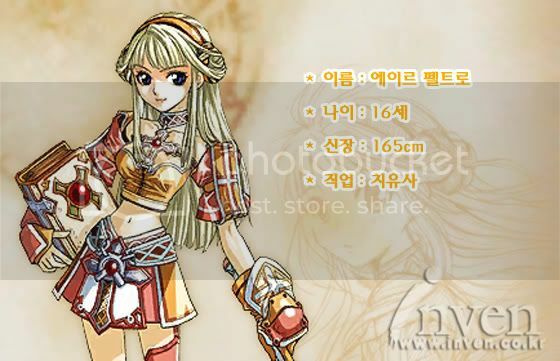 Story : Eir is a 16 year old princess of the Lunia Kingdom. She was born with a gifted ability–healing power, but suffers a inferior complex from her older sister, Lir. In desire to change her fate, she ran away from the Lunia Kingdom and joined her friend Dainn in a journey. Being noble, she is elegant and very haughty. Eir specializes in healing her allies, also using defensive Moon-Type spells. Her weapon is the use of a Wand. Eir is recommended for those that would like to help players, or deal long-ranged damage, or both together. She uses her moon power from the Goddess Lunia. Stage: Eir is useful for healing allies that are in need of aid from dying. She is able to resurrect dead players as well. Her attack spells aren’t of much good, except the section of Sacred. Tears of the Goddess, Holy Spirit, Moon Fog, and Judgment of God can handle things quite well. Scale : 4/2 Hard to keep up in damage, but can do fine healing. PvP: Eir has few creative combos, but with the use of a high strength stat can change her value. Moon Spells such as Crescent Moon Pieces, Moon Bind, and Moon Barrier can help you. Tears of the Goddess, Holy Spirit, and Dodge are really great in the PvP Mode. Little combos, but by using these skills and learning, you can become a great Eir in PvP. Scale : 3 Her combos are somewhat a bit hard. Story : This 19-year old man is a promising and a favorite disciple of Chief Mage ”Rigel”, the head Lunia Kingdom’s Court Mages. Dainn is practicing to become a guardian mage of the kingdom. Having to sense ominous energy surrounding the world, Chief Rigel sent Dainn on a mission to investigate the dark energy. Dainn is heroic and righteous as well as gifted with magic energy. His goal is to protect the peace of his kingdom. While studying with the court mages, Dainn has learned a variety of offensive magic spells. Combining the spells, he can create his own attack spells. Dainn specializes in using Ice, Fire, and Earth spells from far away. He uses a staff for close combat. Dainn is recommended for those that can handle his somewhat slow actions well, and he can handle quite a monster crowd, or one single enemy. Stage: Dainn can use area spells such as Fury of Land, Ocean of Fire, Bitter Cold Breath, Red Fire Dragon, or Death Dragon Breath to take out enemies. His great range can finish enemies quite easily. Scale : 1 Dainn can handle stage very easily. He is favorable in most stages. PvP: Dainn can use single target spells such as Fire Bomb, Ice Arrow, Fire Orb, or Hand of Earth to take out opponents. Combining these spells in the correct timing, fine space, and sequence, you can make Dainn a great player. Scale : 3 His combos are somewhat intermediate, but still a bit easy to trigger. Story : Tia is a half-elf who has a human nobleman as a father and as an elf as a mother. She is on a journey, following the trace of her missing father who was a royal court official whom disappeared into thin air. Practically raised herself, she appears to be tough and independent, but in fact, is tenderhearted. She became a thief to find the keepsake of her father. She is agile, but physically inferior. To hide this weakness, Tia has mastered skills of mirroring images of herself and hiding into the shadows. Her skills are capable of finishing an enemy in one hit. Tia specializes in using twin daggers for quick-action combat to finish her enemies in an instant. Recommendation: Tia is recommended for players that do quick combos in fast-paced key pressing. Time it well, and do it right. Stage: Tia can eliminate single enemies in one hits only. But, area skills like Thunder Shock, which is throwing bombs, and Dark Fog will help you. Surprise Attack will be best on a group of enemies, if you can group them, and hit them behind. Scale : 3 Although not many area attacks, Tia can still dish fine damage. She has problems with monster mobs, though. PvP: Tia is very great in PvP Mode. Her quick-action combos can eliminate opponents quickly. Silp’s Wing, Surprise Attack, Flying Fang, Fairy Thorn Sword, and all kinds of other skills reach best here. Scale : 4/5 Her combos require precise timing, such as timing Surprise Attack in a combo as a finisher. You also need to learn the Half-Dash and many other useful things about Tia. TO UNLOCK LIME : Obtain 50 Deadly Poisonous Jelly Jellies and give it to the unconscious Slime in Episode 4, Stage 8 History Mode, or buy Lime for 24 G Coins. Story: Sieg, Eir, and Dainn happen to rescue a Slime that was dying of poison. 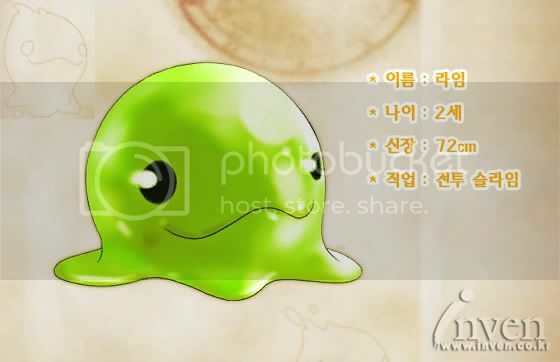 Eir, who loved slimes, named the slime Lime and raised it like a pet. Following Eir where ever she went, Lime joined the party for an adventure. The true power of this slow, weak Slime can transform into various other kinds of slimes and generate potions; this character is helpful for party playing. Lime specializes in using Gelatin, and using Transformations to deal true damage. Recommendation: Lime is recommended for those that like a different style of combat. It’s skills such as Wiggling Jelly and many other sorts are unusual but become very great for those that can handle Lime. Stage: Lime’s transformations are at the best here, which means it is a great damage dealer. Although it will leave Lime vulnerable when alone, it needs help to support the situation. Scale : 2 Lime can deal great damage, but yet still can be somewhat vulnurable. PvP: Lime has very few combos, and only at least three of it’s skills are useful here. Some of it’s transformations are not well here, but if you can use it right, Lime will be great. Scale : 5 Lime is the most vulnerable here, has few combos, and will die soon unless you make Lime work. TO UNLOCK DACY : Obtain 500 gold and give it to Lynette the Fairy in the Square or buy Dacy for 89 G Coins. Story: A boisterous little fairy whose dear wish is to play with her favorite doll, “Jeronica”. Made of special materials, Jeronica cannot be animated to life unlike Dacy’s other dolls. To find the Great Sage who supposedly knows how to animate Jeronica, Dacy arrives to the Rodesia continent, in the appearance of a human girl. This jolly, curious girl can become single-minded and quite stubborn when it comes to her favorites. Gifted with ability to communicate with her dolls, she can animate them to aid in combat. Dacy specializes in summoning uses, along with using Sew and Battle type skills. She uses a doll to whack things. Recommendation: Dacy is recommended for a different-type of combat, one that would like partners in battle or use various skills. She is also gifted with Invincible-type skills, meaning when she uses them, she is invincible when Dacy uses the certain skills like Thunder Candy or Reckless Repeated Punch. Stage: Dacy is able to handle monster groups quite easily, as she has many area and push back skills. Thunder Candy, Bumpy Dash, Boink Glove, and more will maximize Dacy’s use. Scale : 2 Although she does have many uses in Stage, she will run out of Mana fast unless you back it up with Mana Potions. PvP: Dacy is more hard here. As her skills require her to be in one spot, your opponents will be moving around a lot, meaning Dacy will have a hard time here. Freezing their movement like Double Double Needle Bomb or Bundle Bundle Net will be useful, if they can hit. Scale : 5 Dacy has a hard time when your opponent keeps moving around, also having few combos. Think it then act it when you know a plan. TO UNLOCK KRIEG : Obtain 600 Gold along with 100 Fortification Stones and 100 Catalysts and give it to the fairy Lynette in the Square, or buy the Krieg Character Card for 89 G Coins. Story : Krieg is called Moonlight Wolf in the Battlefield and has a reputation of a strongest warrior in history. At the age of 10, he lost his parents to a group of random intruders whom also abducted his baby brother. Since the day his family was devastated, it became the purpose of life for him to become strong, so that he can avenge the death of his parents and find his brother. After 10 years of hellish training, he is entitled “Strongest Monk” of the Batka Temple. But soon after a while, he learned the Batka Temple and Lunia Kingdom were the random intruders whom murdered Krieg’s parents and abducted his brother. Betrayed and shock, he is now on a journey to find the “influential person of the Lunia Kingdom”; the mastermind behind all of what happened to Krieg. Krieg specializes in close-combat attacks with his two hammers, and is able to heal his allies; Health and Mana wise. Recommendation: Krieg is recommended for those that like a brutal, tough character that will deal damage through various skills of his hammers. He can also heal his allies’ Health with spells such as Revival and Party HP Recovery. Stage: Krieg has few area skills, but if you can use it in the right timing, he will use them to deal the largest damage out of it. Although his skills have a somewhat long cooldown time, he can take care of monster groups quite fine, and he is able to defend against attacks for his allies. Scale : 3 His recovery spells are quite useful, and he is not too bad in being a damage dealer in stage mode. PvP: Krieg needs timing and quick actions in order to keep up combos and deal damage. Super Strength and Fire Crush are great here, since you can hit a wide area. He has few combos, but they can deal great damage in the right sequence. Scale : 3 Krieg’s combos are not too hard, not too easy. Takes timing to pull off. He is also useful for healing PvP allies. TO UNLOCK YUKI : Obtain 700 Gold and the Dark Shadow’s Eye, obtained by defeating the boss monster Baphomet, then give the items to the fairy Lynette in the Square. Baphomet drops the item at a 0.3% chance, or buy the Yuki Character Card for 89 G Coins. 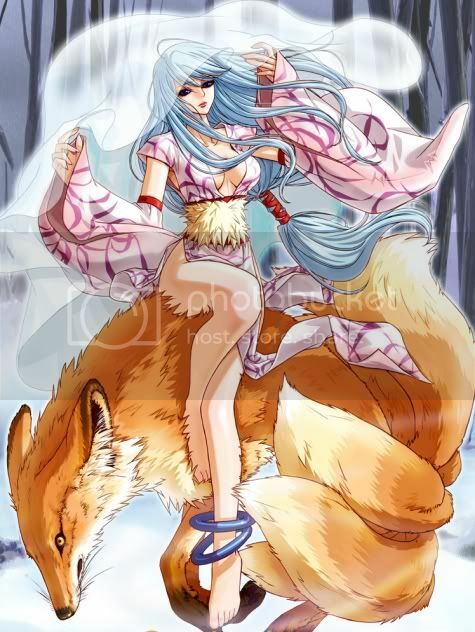 Yuki specializes in using Ice Spirits for her ice-type spells. She has many variations of ice and chill magic. Recommendation: Yuki is recommended for those that like to use all-out various ice-type spells. She is amazing at damage, she has numerous skills that are needed to be leveled up to maximize Yuki’s full potential. Stage: Yuki is great here. Her skills such as Ice Bomb, Icicle Rain Shower, Cold Blue Dragon, and more will eliminate enemies quick. Scale : 1 Yuki handles stage very easily with her skills. She is very favorable in most stages. PvP: Yuki is also great in PvP. Although has variations of combos, she can dish out huge damage when used in the right sequence. Scale : 2 Yuki’s combos are easy to pull off, but need to be used in the right timing. Watch out as when you need to recover mana. 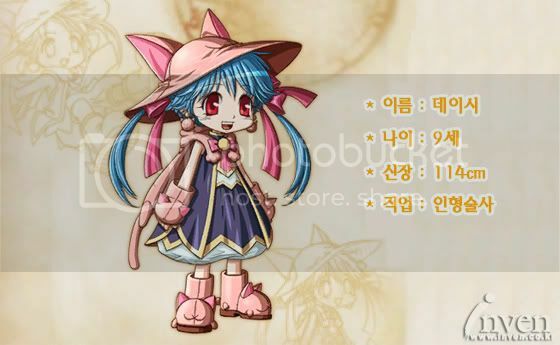 TO UNLOCK ARIEN : Obtain 1,000 Gold and the Dark Shadow’s Eye, obtained by defeating the boss monster Baphomet, then give the items to the fairy Lynette in the Square. Baphomet drops the item at a 0.3% chance, or buy the Arien Character Card for 89 G Coins. Story : Arien is a peace-loving elf, but has a strong sense as a duty to protect her Elven Forest against intruders; she does everything she has in her power–including using force–as long as it is to protect the forest. Being a friend of the Wind, Lightning, and Fire fairies, she has learned to endow arrows with the elemental attributes; she is the only Elven archer that shoots elemental arrows. She is enthusiastic to learn new things, and also having two secret hobbies; bends the bow without an arrow to an invisible enemy, and taking strolls in the Elven forest. 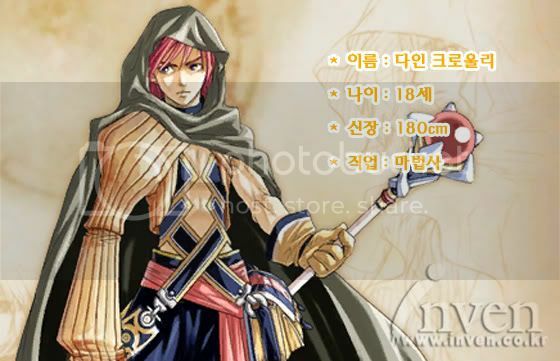 Arien specializes in archery along with the use of Wind, Lightning, and Fire elements from afar. 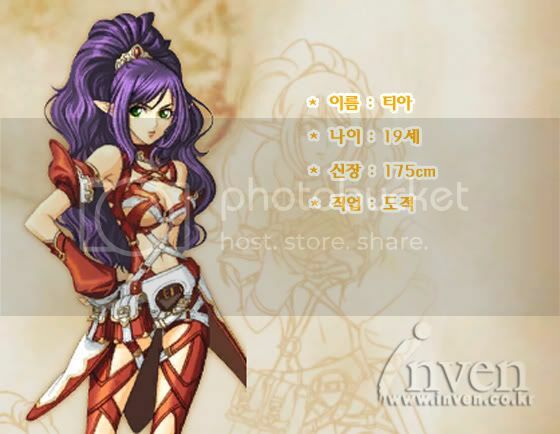 Recommendation: Arien is recommended for the players that like archer-type characters, with addition of Arien’s ability to endow elements to her arrows. She is for those that like to do average to great damage, from close ranged to far away. Stage: Arien has a fine amount of area skills, and she can do great damage on a single enemy. Make sure to watch out for you mana consumption. Scale : 3 Arien can handle things okay, but can lose mana fast if you use too many skills at once. PvP: Arien has few combos and only few skills that can do the greatest damage. She can try to push back the enemy and do skills from afar like Calling Thunder or Edge of Storm that will do decent damage. Scale : 4 Arien can be vulnerable quite a lot if you can’t run quickly. She has area skills but they can miss since you are fighting another player. Be careful and precise in your timing. TO UNLOCK RYAN : Obtain 800 Gold and the Dark Shadow’s Eye by defeating the boss monster, Baphomet, then give the items to Lynette the Fairy in the Square. Baphomet drops the item at a 0.3% chance. Or, buy the Ryan Character Card for 89 G Coins. Story : While not overly reticent, he is not a man of many words. He is a type of man who avoids unnecessary chit chat, and prefers to ponder deeply before putting his plans into action. He spends a lot of time making sure that the weapons on his left and right hands are in top condition. He hunts down the wanted criminals because he needs the bounty for tuning up his weapons. Ryan specializes in using guns as his weaponry, and can unleash the power of many kinds of bullets out of his rail-gun. Recommendation: Ryan is recommended for those that like to use guns from afar, along with many skills that help Ryan succeed in bringing in the enemy to death. Ryan is for those that love guns especially, and like rapid damage from his many arsenal of bullets. Stage: Ryan has a fine amount of area skills, and he can do great with out them. Skills such as Amplified Rail Gun, Iron Bomb, Impartial Shot, Concentrated Shot and more will make Ryan great in stage. Scale : 2 Ryan can be great here, although can run out of mana fast when using too many skills at once. PvP: Ryan needs precise timing when using skills or the key sequences in order to keep a combo up. Freeze Rail Gun, Amplified Rail Gun, Iron Bomb, and more will help Ryan become successful in PvP. Scale : 3 Ryan’s combos are mildly hard to pull off, but alone on the ground, he is great. TO UNLOCK KALI : Obtain 1,000 Gold and the Dark Shadow’s Eye by defeating the boss monster, Baphomet, then give the items to Lynette the Fairy in the Square. Or, buy the Kali Character Card for 89 G Coins. Story : A powerful being whose exploits predate the Age of Pandemonium, she managed to blend in by carefully hiding her true nature. With her real power voluntarily sealed, she is currently enjoying life as a human bard, wandering the world while subtly propagating the influence of Pandemonium in mortal realm. The tune she normally plays is pleasant enough, but the melody of Pandemonium starts to flow from her lute once she engages in combat; the horrible power of her battle music is such that no one has heard it and lived to tell about it. Kali specializes in using the lute and musical melodies in close-combat, songs that would help allies by recovering mana, strength, or speed, along with dark infused melodies that bring horrible effects to the enemies that listen to it. She is also able to transform into a fearsome demon. Recommendation: The burst damage-type character Kali is recommended for those that like to heal allies’ mana with her song and/or use the disordered tunes to defeat enemies. Kali is for those that like to due mid-far ranged damage and style of using melodies. Stage: Kali is fine here. Although she has few area skills, Kali is great when it comes to monster groups or solo. Since her skills require so much mana, keep an eye on your meter to know when to use Mana Potions or your songs. Scale : 2 Kali is decent here. She has great damage attacks. PvP: Kali is also fine here. Her skills can slow the enemies’ movement or stun them, or help your allies with healing songs. Scale : 3 Kali’s combos are a bit hard to trigger, but she can deal great damage with a few skills, or even one skill. TO UNLOCK ASUKA : Buy Asuka for 89 G Coins in the Cash Shop. Or, complete the Street of Heroes quest chain, where as you have to defeat 10 Rotem Guardians in 1-10H, then 100 Drakes in 2-10H, 100 Daru’s in 3-10H, and so on. Then it continues into Legendary, where you finish by eliminating 100 Soldins in Legendary. You will then be rewarded with a 2nd Rebirth Book and Asuka’s Character Card. Story : A pack of monsters invaded the tranquil village of where Asuka spent her childhood. Lotar and his band, who were chasing the pack, arrived in the village–but were a little too late. They managed to save Asuka but everyone else was slain. Asuka was raised by an associate of Lotar to learn to live alone, and train in the way of swords. Her resolve of not wanting to see another orphan leads Asuka to a road trial in order to better herself. Asuka carries a pair of swords about her waist, which are made of rare and luminous stone. Cold and decisive, Asuka is reserved and unfriendly before people, remorseless before monsters. Her lightning-fast swords leave nothing but faint traces and dead bodies. Asuka specializes in using two blades in both hands, using skills of the Shining element. Recommendation: Asuka is recommended for those just like how Sieg is handled with a combination of Tia, in a more stylish version. She is for players that love her beautiful petals left in her long, infinite combos. Stage: Asuka has a mild amount of area skills, but yet they can do great damage in her various styles of slicing and dicing. She is decent here. Scale : 3 Asuka is average on damaging. She needs to be supported by healing to keep up. PvP: Asuka. Is. An. Air combo character. Madly. She has many combos and require precise timing and distance from skill uses. Try to do as much damage as possible on the ground, because her skills can get you to decaying air combo damage quick. Scale : 3 Asuka is great in PvP, her combo’s are mildly easy-to-difficult to pull off. TO UNLOCK RALPH : Buy Ralph for 89/101 G Coins in the Cash Shop, or complete the quest from Lynette the Fairy, whereas you must obtain 1,000 Gold and a Dark Shadow’s Eye. Story : Ralph has no memory of his parents. The only thing he remembers is just living with other homeless children in the dark corner of an alley. His whole life was a series of fights. He hates harassing others, but is willing to fight for himself and the things he wants to protect. Despite his shadowy past, he remains cheerful and energetic. He can’t bear to see anyone harassing the weak. After escaping his life as a street fighter, Ralph is on a new journey to find a new life for himself. Ralph specializes in using his fists and kicks in close-combat. His skills are different through his type of fighting style. Recommendation: Ralph is recommended for those with a play style that likes a tough-looking man that likes to use fists and kicks into knocking out your enemies. He is for players that like speedy combos and finishes. Stage: He is overwhelmingly powerful. His skills are amazing, and they are pretty neat. His damage is high, making him a fine stage character. Scale : 2 Even though he is great, you should watch your mana consumption. PvP: There are many variations for Ralph’s combos, and some are hard to land. Overall, he is a great character in damage, but make sure the hits hit. Scale : 3 Ralph is a bit between intermediate and difficult, but is average in play style. TO UNLOCK DARK EIR : No Unlock is needed. Dark Eir is free. Dark Eir specializes in using the dark powers of Zugren, God of Darkness. She uses her dark magic and powers of chaos with the wand and book she carries. Recommendation : Dark Eir is recommended for those with a different play style of varying dark magic. She is for the ones that like debuffing the enemy first before attacking, and occasionally healing her allies. Stage : Dark Eir is powerful, depending on how your skill build with her is. If you choose the right skills and use them, she is very great. Scale : 3 Even though Dark Eir is powerful, she will have mana problems. Watch your skill spam. PvP : Dark Eir is also good here, but in order to deal sufficient damage, you must use the right sequence of skill-chains or A and S combination. Due to her fast speed, you may have control problems. Scale : 3 Powerful, yet you may have problems with controlling. TO UNLOCK ARTA : No Unlock needed. Arta is free. Story : Arta is the lightly-hearted and pleasant engineer of Henry’s Lab. Her genius allowed her to graduate Teurel Private School within a year, only to accept employment in Henry’s Lab because she could create anything of her liking there. She has participated in most of the projects in Henry’s Lab; including Jack, Charlotte, and most recently, a time machine. Most of her energy was spent on the creation of this time machine, which turned out a success. However, when she tried to go back in time, Henry, who knew the dangers involved, persuaded her not to use the new time machine. But this was merely a temporary deterrence to her insatiable curiosity. Arta, with full confidence in her own combat-oriented devices, activated the time machine to travel back in time, never suspecting the danger that would befall her. Arta specializes in using many battle devices, such as a machine gun, bombs, and other robotic devices. In close combat, she pummels away enemies with her heavy hammer. She is also to create exclusive fortification stones, catalyst, and dimly gems that can power up support equipment and accessories. Recommendation : Arta is recommended for those that like a cute girl, who is slow and clumsy with her hammer but is immensely powerful. She is for the ones that love to deal lots and lots of damage. Stage : Arta is very great in stage. Mana is not usually a problem (most of the time), and her skills do massive damage that you could even solo a boss. Scale : 1 Arta handles stage very easily. Mana is or not a problem. PvP : Arta is quite average here. Her most powerful skills require the enemy to be frozen or still, or they shouldn’t know by casting her skills from afar. Arta is slow and cannot counter as much, but if you can land hits, you’ll win. Scale : 3 Arta is powerful, but the enemy will probably not allow their selves to be hit easily. Hide your skills from afar to surprise them, or trap them. TO UNLOCK GAON : No unlock needed. Gaon is free. Story : Many millennia ago, the dragon-kin ruled the world alongside the ancient gods. But, after a time of trouble, gods disappeared from the world and the dragon named Gaon who embraced “the power of chaos” went into a deep slumber. Many years later, Nephron found a way to revive the gods and, unknowingly woke up Gaon. When Gaon woke up, he was in human form and realized his capability of wielding lightning skills from the “power of chaos” disappeared. Due to his lost power, he was not able to revert back to his original form and in hopes to regain his power, he begins a journey with Sieg and his party in the present day. Gaon specializes in using the great spear combined with the element of lightning, as well as summoning his no longer latent powers of the dragon. Recommendation : Gaon is for those that love the use of his spear, dealing a variety of lightning skills and summoning a powerful dragon to aid you. He is for those that like a moderate like pace, as a moderate to high damage dealer. 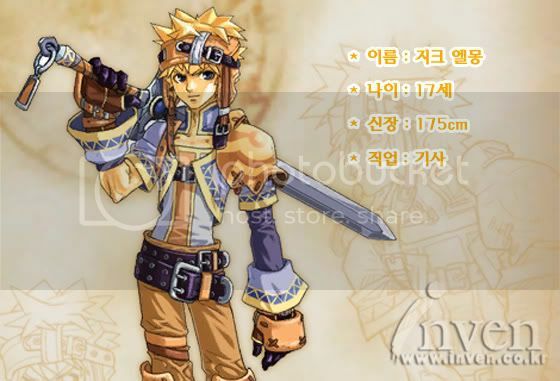 Stage : Gaon, depending on your use of his amazing lightning and dragon skills, is a great damage dealer in stage. He will seem weak at first early levels, but level up the correct skills and you’ll be great. Scale : 2 Gaon handles stage great with his powerful skills at late levels, but he is not the best. PvP : Not many know this, but Gaon is a high air combo user. You need to learn how to get the enemy so high and keep him or her so high with Gaon, in other words, air infinite. That trick will keep you successful. Otherwise, use many ranged or close skills and time your hit. Scale : 3 Sometimes you’ll have trouble, but that all depends on your opponents. Gaon can handle easily by either skill spam, or you can use air infinite and keep at it until they die. TO UNLOCK IRIS : No unlock needed. Iris is free. Recommendation : Iris is recommend for those that love a very stylish kind of game play, where you can use long-ranged chain sword abilities and a mix of fire magic to destroy enemies. Stage : Iris has lots of skills, and few to half are her most devastating. When used well, Iris can become a powerhouse just as near as everyone else. Scale : 2 Iris handles stage easily just as most as everyone else. Survivability is a slight problem, but use her skills right and you’ll live. PvP : Melee is a big reason to learn in PvP. To become an excellent Iris player, one must master her melee chains just like Asuka and Gaon. However, you can still survive with her powerful Crimson and Flame skills, just not as much. Scale : 2-3 2: Master melee. 3: Slightly harder to survive and a bit more difficult to take out opponents. But enough skill use and 3 is not a problem. "complete the Street of Heroes quest chain, where as you have to defeat 10 Rotem Guardians in 1-10H, then 100 Drakes in 2-10H, 100 Daru's in 3-10H, and so on." Is it 10 rotem guardians in 1-10H or 100 of them?